A website presenting complete information- photo galleries, History, maps, etc. 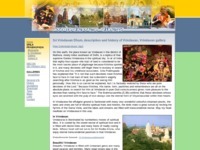 about Sri Vrindavan Dham. Category Pilgrimage sites June 9, 2012 by ISKCON Desire Tree.